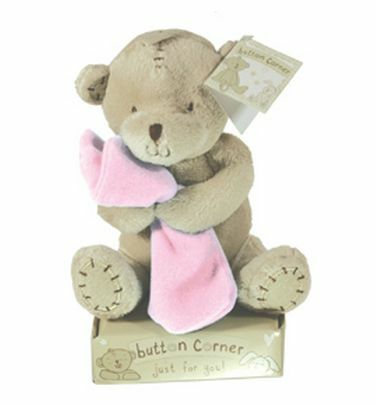 A Keepsake Teddy Bear with Pink Blanket gift set has been beautifully made and come complete with matching gift tag. Supplied in a decorative presentation box. Cream coloured design sitting on top of a matching box. A superior baby gift range. Made in a Neutral colour scheme using gentle creams and oatmeal, which has been chosen to reflect the current trend in nursery colours. The star of the range is the cutest teddy which appears on each product as well as the packaging. Each piece is packaged in a beautiful gift box together with a coordinating gift tag that provides a treasured and welcomed keepsake. This item is made in and shipped from Yorkshire England. Please be advised that your items take approximately 14 days to make before they can be sent to you.